It's been a few days since I've had a download on offer for something other than U2, so it's great that Indiecater has another stellar new release. 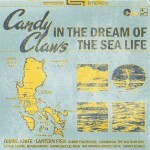 This time it's Candy Claws, and their excellent In the Dream of the Sea of Life, an album bound to appeal to lovers of Panda Bear and Animal Collective. I have a preview download below, but on the site you can stream the album in full and then buy it for €4!